David Maraniss writes in his book "Into the Story: A Writer's Journey Through Life, Politics, Sports and Loss" that "of all the relationships in Obama's life, none was deeper, more complex, and more important than that with his mother." Although Obama lived under the same roof with his mother, Madelyn Dunham, for only twelve years, "her lessons and judgements were always with him." In addition. Obama has repeatedly credited his grandmother Madelyn Dunham for making him the man he is today. Dunham and her late husband, Stanley, raised Obama from when he was 10 years old until he went to college. This is the story of Barack Obama's mother and how three of her most formidable years were spent growing up on Ponca City, Oklahoma and the story of Obama's maternal grandparents Stanley Dunham and Madelyn Dunham with a focus on their years in Ponca City. In 1951 Stanley Dunham purchased this home on North 13th Street right across the street from the Episcopal Church. Because of the move, Stanley Ann was in a new school district and beginning in September 1950 Stanley Ann attended third grade at Roosevelt School. Stanley Dunham sold his house on North 13th Street after living in it for one year and he and his family left Ponca City. Photo: Copyright Hugh Pickens All Rights Reserved. 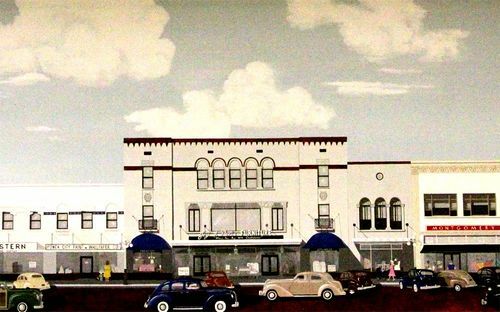 An artist's rendition of the 400 block of Grand Avenue in Ponca City, Oklahoma in the 1940's. Stanley Dunham worked as a furniture salesman for three years at Jay Paris Furniture store, the three story building in the center of the photograph. Photo: Copyright Hugh Pickens All Rights Reserved. Barack Obama's mother, Stanley Ann Dunham, was born in Kansas in 1942 and lived in Ponca City for three years while she was a child attending first, second, and third grades in the Ponca City School System. An article in the Washington Post says that "she and her parents lived in Berkeley, Calif., for two years, Ponca City, Okla., for two years, and Wichita Falls, Tex., for three years before they ventured to the Seattle area". Wikipedia says that her "family moved to Mercer Island, Washington in 1956" so Barack Obama's mother Stanley Ann Dunham lived in Ponca City for two years starting in 1948 when she was six years old and she attended first, second and third grades in Ponca City. Beverly Bryant reported in the Ponca City News that Ponca City school records confirm that the family arrived in Ponca City in 1948 and lived in Ponca City from 1948 to 1951 and that Barack Obama's mother, Stanley Ann Dunham, attended first and second grade at old Jefferson Elementary School and third grade at Roosevelt Elementary School in Ponca City. In Barack Obama's memoir, "Dreams From My Father," he describes his grandparents as "stern Methodist parents who did not believe in drinking, playing cards or dancing." The Dunham family was known to be a churchgoing family so we conjecture that the family may have attended First Methodist Church while in Ponca City although this has not been confirmed. The Dunham family would have been a young married couple, she in her mid twenties and he in his early thirties, who had been married for eight years in 1948 with a daughter named Stanley Ann six years old. Stanley Dunham's parents were Ralph Waldo Emerson Dunham, Sr. and Ruth Lucille Armour,  from Wichita, Kansas. His father's ancestors settled in Kempton, Indiana in the 1840s. Ralph and Ruth Dunham were married in a home on S. St. Francis, Wichita. They then opened The Travelers' Cafe on William Street in downtown Wichita. The Dunhams were Baptists. Unlike his wife's family, the Paynes, Stanley Dunham did not come from a white-collar background. At age 8, Stanley discovered his mother's body after she had committed suicide. 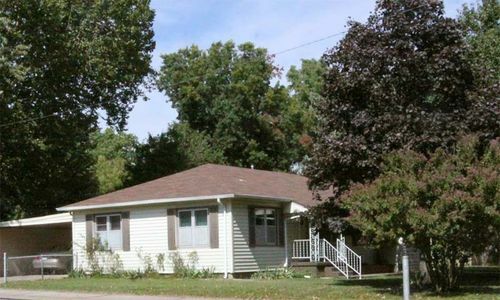 Following his mother's suicide, his father abandoned the family and Stanley and his brother, Ralph, were sent to live with his maternal grandparents in El Dorado, Kansas. He punched his high school principal and was kicked out of school. Susan Peters writes for KAKE News that before the war Dunham worked as a salesman at Hellum’s Furnuture on South Main in Wichita and lived in a Riverside home at 917 Faulkner. Peters writes that the Dunhams "could hardly wait to leave Kansas, which they soon did after their Wichita wedding." "By most accounts, Stanley was a bit wild, writes Susan Peters. "He was actually suspended from El Dorado High School after punching his principal. He did graduate in 1936. According to our president, he was a charmer to the ladies in his day." Francis Lawrence, who attended school with Madelyn Payne from kindergarten until their graduation from Augusta High School in 1940, says Madelyn was an honor roll student until her final semester when she met Stanley Dunham, after which she says Madelyn didn’t want to do anything with anyone except Stanley. "Madelyn Payne skipped what was considered prom night at Augusta High and instead eloped with Stanley in Wichita, most likely exchanging vows at the old Sedgwick County Courthouse," writes Peters. After they were married, Stanley and Madelyn Dunham lived in El Dorado before moving to Wichita where their daughter, President Obama’s mother, was born. Barack Obama's grandfather Stanley Dunham managed a furniture store in El Dorado Kansas before World War II. Dunham volunteered for service in the US Army the day after Pearl Harbor. Nancy Benacs writes for the Associated Press that Dunham spent the first year and a half of his war service in the United States, part of it in the 1802nd Ordnance Medium Maintenance Company, Aviation, at Baer Field in Indiana, now Fort Wayne International Airport. Dunham transferred to the 1830th Ordnance Supply and Maintenance Co., Aviation in March 1943, and the unit shipped out to England on the HMS Mauretania in October 1943. Once in England Dunham was a supply sergeant stationed at Stoney Cross, England, near the English Channel with the U.S. Army Air Forces in the 1830th Ordnance Supply and Maintenance Co., Aviation when the invasion of Normandy began in June, 1944. Dunham's company supported the 9th Air Force as it prepared for the assault on Normandy. Benacs found that on Dunham was well liked in his company during their assignment in England and that "to the 75 men of Dunham's company, he was a good guy to have around." "On May 31, 1944, payday, Dunham had taken up a collection of 35 British pounds — about $150 in today's dollars — to finance the event," writes Benac. "He lined up a convoy of girls from Southampton who, the men hoped, would be 'simply smashing,' as his commanding officer, Frederick Maloof, wrote in his diary." In July 1944, six weeks after D-Day, Dunham's unit crossed the English Channel and landed at Omaha Beach. In his autobiography, Obama reports that during the war his grandfather was "sloshing around in the mud of France, part of Patton's Army." "Sgt. Dunham has been doing a good job as Special Service noncom," wrote Dunham's commanding officer 1st Lt. Frederick Maloof in a report in September 1944. In February 1945, Dunham's unit was assigned to Patton's 3rd Army at Saint-Dizier, and Dunham remained in that company until early April 1945. On April 7, 1945, one week before the 1830th moved on to Germany and three weeks before Hitler commits suicide, Dunham transferred "to the infantry," the unit history shows and was assigned to the 12th Reinforcement Depot, based in Tidworth, England, where replacements were being trained for depleted combat units. Four months after he transferred out of the 1830th, Stanley Dunham was discharged from the Army on Aug. 30, 1945, at Fort Leavenworth. 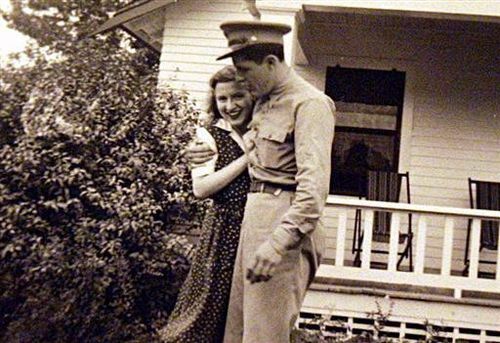 While Stanley was fighting in Europe, his wife Madelyn Dunham worked on a Boeing B-29 assembly line in Wichita as a quality control inspector. After returning from the war, Stanley enrolled at University of California, Berkeley on the G.I. Bill. "Gramps returned from the war never having seen real combat, and the family headed to California, where he enrolled at Berkeley under the GI Bill," Obama wrote in "Finding My Father". "But the classroom couldn't contain his ambitions, his restlessness, and so the family moved again, first back to Kansas, then through a series of small Texas towns, then finally to Seattle, where they stayed long enough for my mother to finish high school." The Dunham family moved from Berkeley, California to Ponca City, Oklahoma.. 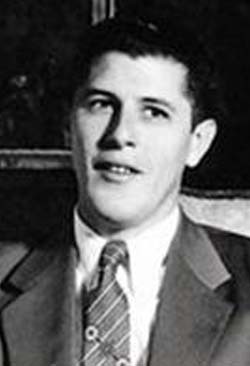 While living in Ponca City Stanley Dunham worked as a salesman for Jay Paris Furniture Company. Described as "gregarious, friendly, impetuous, challenging and loud," Barack Obama's grandfather Stanley Dunham "could charm the legs off a couch" the New York Times reported. 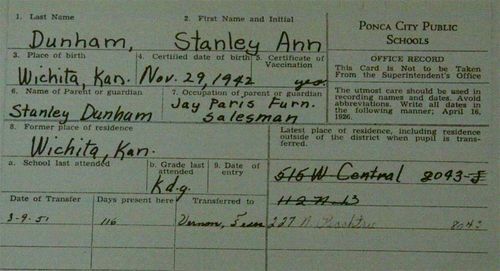 Stanley Dunham was 30 years old in 1948 when he was living in Ponca City working as a salesman at Jay Paris Furniture. One man who knew Stanley Dunham well and recognized Stanley's photo as soon as he saw it was former Ponca City resident Bob Casey who worked with Stanley Dunham at Jay Paris' Furniture Store in Ponca City in the early 1950's. Mr. Casey says that Stanley arrived in Ponca City in 1949 and stayed in Ponca City with his family for "more than a year." Mr. Casey says Stanley was a very smart guy with a long face and large shoulders who knew a lot about the furniture business and was one of Jay Paris' top salesmen at a time when the furniture company probably had 6 or 7 salesman. Mr. Casey, now living in Cranes Mill Texas, says that Stanley knew the technology of furniture, could analyze customers, and was one of the first salesmen to sell furniture as a full concept instead of by the item. "He could sell you a room full of furniture," says Casey. "And he could help you decorate it." Mr. Casey remembers a trip to Wichita with Stanley where they attended one of the first decorating seminars in the area. "Stanley was always working to improve himself" said Mr. Casey adding jokingly that Stanley "was a smart guy who liked to tell you how smart he was." Mr. Casey says he and Stanley Dunham used to joke around together and Stanley once made a bet that Casey couldn't do a specified number of push-ups. "I did the push-ups and surprised Stanley," says Mr. Casey. Mr. Casey doesn't know exactly when Stanley Dunham and his family left Ponca City because shortly thereafter Mr. Casey went away to attend college at Oklahoma State University. Mr. Casey added that although he knew Stanley Dunham well, he never met Stanley's wife or daughter. "In those days the employees at Jay Paris' didn't really socialize much outside the job." Longtime Ponca City resident Pat Moore also remembers Stanley Dunham and remembers that the Dunham family lived in an apartment in Ponca City. Beverly Bryant reported in the Ponca City News that the Dunham family lived in homes on West Central and later on North 13th street while they were in Ponca City. Moore remembers that Stanley Dunham was in Ponca City when she and her husband got married in 1950 and remembers that Stanley had a good sense of humor. Even after almost 60 years Moore can still remember a funny story with some humorous marital advice that Stanley gave Moore in 1950 before Moore and her husband got married. Another Ponca Cty resident who remembers Stanley well was Bill Piel. Piel was a student at Ponca City High School and worked part time at Jay Paris after school. Piel was a member of the high school wrestling team and one day the salesman started kidding Piel saying that Piel even with his training couldn't beat Stanley in a wrestling match even though Stanley outwieghed Piel by about 180 pounds to 135 pounds. Piel said that he and the salesman adjourned to the third floor of Jay Paris where they could wrestle on the 9 by 12 foot carpets that were stored up there. Piel said that even though Stanley probably weighed 180 pounds, he didn't appear to have any wrestling experience and Piel says that once they got started "it took me about 30 seconds to get Stanley in an arm brace and that was the end of that." Piel adds that Stanley was a "really nice guy" but he could be a "bit overbearing at times." When Stanley Dunham first moved to Ponca City in 1948, he and his family rented a duplex on West Central Avenue and his daughter Stanley Ann attended first and second grade at Jefferson School. In 1951 Stanley Dunham purchased a home in on North 13th Street right across the street from the Episcopal Church. Because of the move, Stanley Ann was in a new school district and beginning in September 1950 Stanley Ann attended third grade at Roosevelt School. Stanley Dunham sold his house on North 13th Street after living in it for one year and he and his family left Ponca City. After leaving Ponca City, the Dunham family would move to Vernon, Texas then Wichita Falls, Texas and then back to El Dorado, Kansas. In 1955, Stanley and Madelyn moved to Seattle, Washington, where he got work as a salesman for the Standard-Grunbaum Furniture Company, and where their daughter Stanley Ann attended Eckstein Middle School. They lived in an apartment in the Wedgewood Estates in the Wedgwood, Seattle neighborhood. In 1956 they moved to the Shorewood Apartments on Mercer Island, a Seattle suburb, where they lived until 1960 and where their daughter Ann Dunham attended Mercer Island High School. In 1957 Stanley began working for the Doces Majestic Furniture Company. While living on Mercer Island the Dunhams attended services at the East Shore Unitarian Church in Bellevue, Washington. Madelyn and Stanley then moved to Honolulu, where he found a better furniture store opportunity. Stanley Dunham died in Honolulu, Hawaii in 1992 and is buried there in the Punchbowl National Cemetery. 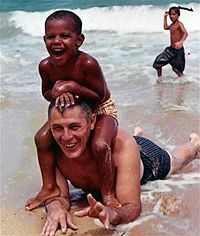 Stanley Dunham and his wife Madelyn helped raise their grandson Barack Obama during his high school years, when his mother was living in Indonesia. Barack Obama loved his grandfather who died in 1992 at age 74. In 2008 Obama visited Punchbowl National Cemetery in Hawaii, to pay homage to his grandfather Stanley Dunham. Obama and his half-sister Maya Soetoro-Ng refer to Madelyn Dunham as "Toot" — short for "tutu," the Hawaiian word for grandmother. In his book, Obama described his grandmother as "quiet yet firm", in contrast to Obama's "boisterous" grandfather Stanley. In an interview with the New York Times published May 3, 2009 Obama talked about his grandmother at length. "My grandmother never got a college degree. She went to high school. Unlike my grandfather, she didn’t benefit from the G.I. Bill, even though she worked on a bomber assembly line. She went to work as a secretary. But she was able to become a vice president at a bank partly because her high-school education was rigorous enough that she could communicate and analyze information in a way that, frankly, a bunch of college kids in many parts of the country can’t," said Obama. "She could write a better letter than many of my — I won’t say “many,” but a number of my former students at the University of Chicago Law School." Madelyn Dunham was born Madelyn Payne in Peru, Kansas, on October 26, 1922. When she was 3 years old, Payne's family moved to Augusta, Kansas, where young Madelyn was raised. Tim Jones writes in the Baltimore Sun that Madelyn Payne parents were stern Methodists parents who did not believe in drinking, playing cards or dancing. Jones adds that Madelyn Payne was one of the best students in the graduating class of 1940 and that in ways that would foretell the flouting of conventions by her daughter Stanley Ann, Madelyn was different. "A bunch of us would go to Wichita, to the Blue Moon Dance Hall," said Nina Parry, a classmate who still lives in Augusta. "We'd hear Benny Goodman and Tommy Dorsey and Glenn Miller. . . . All the big bands came. It was wonderful." Bill Meyer wrote for the Cleveland Plain Dealer that as a child Madelyn was a voracious reader. In 1939, when Simon & Schuster introduced the U.S. to paperbacks with its Pocket Books series, Madelyn subscribed writes Meyer. She devoured titles like James Hilton's "Lost Horizon," Emily Bronte's "Wuthering Heights," Five Great Tragedies" by Shakespeare and "The Murder of Roger Ackroyd" by Agatha Christie -- which fed a lifelong love of murder mysteries. In his memoir, Obama writes that his grandmother's family "generally shunned the tent revival circuit, preferring a straight-backed form of Methodism that valued reason over passion and temperance over both." Some have reported that the Paynes looked askance at dancing and card-playing, but Jack says his parents were big penuckle fans. The Paynes were Republicans but classmate Francine Buchanan recalls that they allowed her mother to take Madelyn to Wichita to hear Franklin D. Roosevelt speak. Madelyn was a good student, always in the first division in school in Augusta Kansas. In a 1937 school annual, her student quote was, "Don't judge me by name." There wasn't much to do in Augusta writes Meyer. "The gang would hike to the town lake, or catch a serial at the Augusta Theatre on State Street, one of the first cinemas around to have air conditioning. Kids went to one of the town's two drug stores -- Cooper's or Carr's -- for ice cream sodas or to Lehr's for fried chicken." Stephen Mansfield writes in his book "The Faith of Barack Obama" that Stanley Dunham and Madelyn fell in love in Kansas and later married on the night of a junior/senior prom just weeks before her high school graduation in 1940. "Madelyn was frequently described by neighbors as different," writes Mansfield. "a gentle word for her eccentricities, and few were likely surprised when she met, and then secretly married furniture salesman Stanley Dunham." Stanley Dunham was notoriously loud and gregarious while Madelyn was bookish and sensitive. Stanley Dunham was Baptist and from a blue collar world, while Madelyn was a Methodist who was solidly middle class. Madelyn Payne married Stanley Armour Dunham in 1940. "Madelyn and the other girls would often gather at classmate Nina Parry's house for slumber parties. It was at one such sleep over, a couple of weeks before graduation in 1940, that Madelyn dropped a bombshell -- she'd gotten married without her parents' permission," writes Meyer. Stanley Dunham was from the nearby town of El Dorado. In his book, Obama paints the scene of Rolla Payne's first impression of the boy with the "black, slicked-back hair and his perpetual wise-guy grin." "He looks like a wop," he quotes Rolla as saying. Dan Nakaso reports in USA today that Madelyn Dunham attended college at the University of Washington before becoming an aircraft inspector for Boeing during World War II. 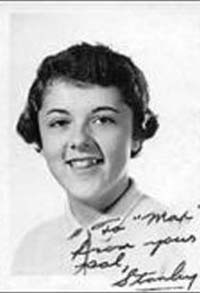 "She was from the part of the country where a girl sets out to be a wife and a mother and ends up building airplanes for the war effort," said Alice Dewey, University of Hawai'i anthropology professor emeritus, who was Ann Dunham's graduate studies adviser and became a family friend. 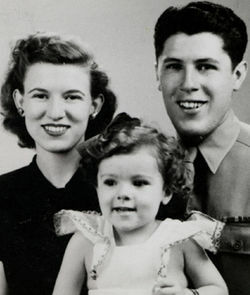 Bill Meyer writes that while Dunham was in the army during World War II moving from base to base, Madelyn went back home with her daughter.r. She landed a job on the night shift at the Boeing plant 15 miles down Highway 54 in Wichita, commuting each day. Madelyn was a supervisor on the B-29 bomber assembly line. She wasn't exactly "Rosie the Riveter" -- more like "Rosie the Quality-Control Inspector."r. Dewey described Madelyn Dunham as "a bit shy, not a chatty kind of person. But she had decided opinions on whatever we were talking about, which was often political. She would get information and have an opinion and tell you why. ... She was always very affectionate with Ann and with Barry." During World War II, while Stanley Dunham served in the Army. Madelyn worked on a Boeing B-29 assembly line in Wichita. Her brother Charlie Payne was part of the 89th Infantry Division, which liberated the Nazi concentration camp at Ohrdruf, a subcamp of Buchenwald, a fact Barack Obama has referred to in speeches. After the war the family started out in El Dorado, Kansas, where Stanley had managed a furniture store and Madelyn worked in restaurants. Then the family moved to California where Stanley attended UC-Berkeley on the GI Bill. Madelyn also attended some classes at UC-Berkeley. Barack Obama's grandmother, Madelyn Dunham, was 26 years old in 1948 when she arrived in Ponca City. Ponca City was a thriving community in the late 1940's when Stanley Dunham and his family arrived in Ponca City. 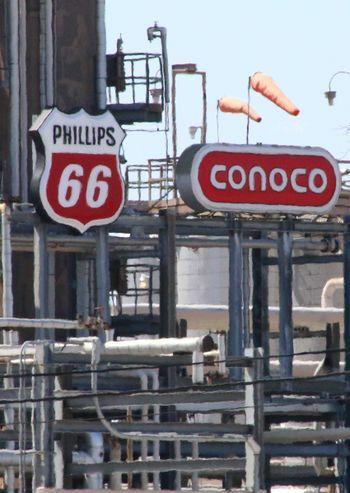 Ponca City was the headquarters for Continental Oil Company (Conoco) and had a huge refinery at Ponca City employing thousands. It is not yet known if Madelyn Dunham worked outside the home but it is documented that in other places she lived like Wichita, Seattle, and Honolulu, Madelyn worked outside the house so it is very possible that with her daughter Stanley Ann in school, Madelyn Dunham had a job outside the house while she was living in Ponca City. If Madelyn Dunham did have a job while her husband worked at Jay Paris Furniture and her daughter attended elementary school, no one has yet come forward who knew her or remembered her working outside the house. 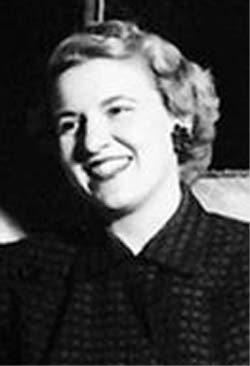 Madelyn Dunham had strong administrative skills as evidenced by her work during the war when she worked as a quality control inspector for an assembly line building B-29's in Wichita. Here is what we can conjecture about Madelyn Dunham's employment in Ponca City. Later on in her life Madelyn Dunham worked as an escrow officer at a bank and was later vice-president of a bank in Washington State, so if she worked outside the home while she was living in Ponca City, it is possible that she may have been at a bank. Banks that were open in Ponca City at that time would include the First National Bank, the First Security Bank, and Ponca City Savings and Loan, so we conjecture that with her daughter in school, Madelyn Dunham may have worked at one of these banks. Some say it is possible that with her experience as a quality control inspector during the war, she may have found work at Continental Oil Company or Cities Service while she lived in Ponca City. Others say that as a woman without a college education in the late 1940's, many doors were closed to her that might be open today. Anyone who may have known or worked with Madelyn Dunham in the late 1940's or early 1950's at any of these locations, please contact us at 580-765-6125 so we can update this story. David Remnick reports in his book, "The Bridge," that according to Madelyn Dunham's friend Francine Pummill, Madelyn Dunham had a miscarriage and a hysterectomy while the family was living in Ponca City and so Stanley Ann remained an only child. 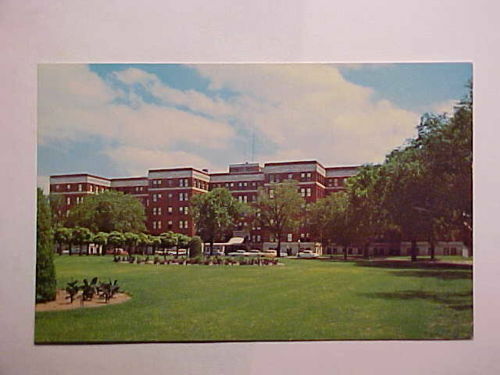 It is not definitely known in what hospital Madalyn Dunham received her treatment, but in 1948 before the advent of Interstate I-35 it was a difficult, three hour drive to the nearest large cities (Tulsa, Oklahoma City, Wichita) and so we conjecture that Madelyn Dunham was treated at St. Joseph Regional Medical Center in Ponca City. St. Jospeh's (later renamed Via Christi Oklahoma Regional Medical Center) is a Catholic, not-for-profit, hospital that served the healthcare needs of Ponca City, north central Oklahoma and south central Kansas from 1919. In 1948 St. Jospeh's had approximately 50 beds. In 1951 the Dunham family left Ponca City. Dan Nakaso reports in USA Today that Madelyn Dunham "blazed a feminist trail in Hawaii banking circles in the late 1960s and early 1970s and rose to become one of the Bank of Hawaii's first female vice presidents." "Was she ambitious? She had to be to become a vice president," said Clifford Y.J. Kong, 82, who was a senior credit officer at the bank at the time. "She was a top-notch executive to get appointed. It was a tough world." Dunham rose from the secretarial pool to be a Bank of Hawaii vice president. Current and former Bank of Hawaii executives remember Madelyn Dunham as a tough boss with a soft side for those willing to work hard. "The first day I met her, I was totally scared," said Dennis Ching, who was a 23-year-old management trainee under Dunham beginning in 1966. "She was the Grande Dame of escrow who started the local escrow association. I was just a trainee who didn't know anything about escrow whatsoever. But she gave me a file and said, 'You're a college grad. Here, close this.' You don't know how to swim, and she throws you in, and you either sink or swim." Hawaii State Senator Sam Slom worked in economics and business research for Bankoh while Dunham was rising to the position of vice president, and also lived one floor beneath Dunham and Obama in the Punahou Circle Apartments. "Anybody who worked with her or for her for any period of time had to be impressed with her professionalism and dedication," says Slom.v "She was just from the old school: Work hard, give a full day's work for a full day's pay. She inculcated that with anybody that came in contact with her. She didn't share or tell jokes or light moments. Her whole life was business. Nobody doubted her integrity or her honesty. She never tried to do the right things or say the right things for personal advancement. She did them because she believed in them. She was quoted as saying Stanley wears the pants. But no one who knew her would believe that. She was clearly in charge." "Madelyn was the salt of the earth. She was a wonderful person to have working for you because she always kept you out of trouble, made the boss look good," said Howard Stephenson, the man who hired Dunham. Dunham was considered by many as the founder of the escrow business in Hawaii. Title Guaranty President David Pietsch called her the "dean" of escrow and remembers testifying with her at the Legislature. Pietsch remembered seeing Obama as a child. "I just remember seeing this young boy walking around the bank at the end of the day waiting for his grandmother," said Pietsch. "I shall always, always in my mind and in my heart remember Madelyn as a wonderful friend with a great sense of humor and a very caring person. I will miss you Madelyn," said Helen Osgood, Bank of Hawaii co-worker. Hawaii's U.S. Representative Mazie Hirono credits Dunham for deeply influencing not only Obama, but also for making her what she is today. Right after she graduated from the University of Hawaii, Hirono worked at the Bank of Hawaii for Dunham as a temporary employee. "She reinforced in me this idea that you can do a lot of things as a woman if you are focused," Hirono said. 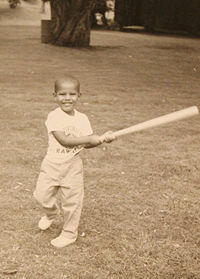 Young Barack Obama was born on Aug. 4, 1961. When his father left Hawaii to pursue his education, Barry and his mother stayed behind. Aside from a four-year interlude during which he lived in Indonesia with his mother and stepfather, Obama spent his childhood in Honolulu -- most of it in his grandparents' two-bedroom, high-rise apartment at 1617 S. Beretania St. Obama writes fondly of looking up from the basketball court to find his grandmother, affectionately called "Toot," watching him practice from the 10th-floor window and has vivid memories of his grandmother heading to the office. "Every morning, she woke up at five a.m. and changed from the frowsy muu-muus (sic) she wore around the apartment into a tailored suit and high-heeled pumps," Obamawrites. Obama says Toot took a secretarial job at Bank of Hawaii "to help defray the costs of my unexpected birth." After the Obama marriage fell apart, Barack Obama spent four years with his mother and her second husband in Jakarta, Indonesia but returned to the United States in 1971 at age 10 to live with his maternal grandparents in the Makiki district of Honolulu and enrolled in the fifth grade at the Punahou School. Obama's mother eventually earned a Ph.D. in anthropology and went on to be employed on development projects in Indonesia and around the world helping impoverished women obtain microfinance. She returned to Indonesia in 1977 for her Masters' fieldwork and Obama stayed in the United States with his grandparents. Obama writes in his memoir, Dreams From My Father, "I’d arrived at an unspoken pact with my grandparents: I could live with them and they'd leave me alone so long as I kept my trouble out of sight." Madelyn Dunham took Obama on his first tour of the contiguous United States, traveling by Greyhound bus and stopping at Howard Johnson's along the way. Madelyn showed Obama the Grand Canyon, Yellowstone, Disneyland and, finally, Chicago -- the city where he would hone his skills as a community organizer, meet his future wife and launch his political career. Obama's sister, Maya Soetoro-Ng, says many of the qualities that got Obama this far came from Toot. "From our grandmother, he gets his pragmatism, his levelheadedness, his ability to stay centered in the eye of the storm," Soetoro-Ng told The Associated Press. "His sensible, no-nonsense (side) is inherited from her." In "Dreams," Obama describes his grandparents as "vaguely liberal." He recounts an incident in which his grandmother was upbraided for addressing a black janitor, a World War II veteran, as "Mr. Reed." Despite the warning, she continued to use the honorific. "'Your grandfather and I just figured we should treat people decently, Bar,'" he remembers her telling him. "She's wise that way, my grandmother, suspicious of overwrought sentiments or overblown claims, content with common sense." But it was another incident, one to which he was a party, that had a most profound effect on the biracial teenager. Toot had asked her husband for a ride to work because a particularly aggressive panhandler had accosted her for money the day before. When Stanley refused, his grandson couldn't understand why. "She's been bothered by men before," his grandfather explained, according to the memoir. "Before you came in, she told me the fella was black. That's the real reason why she's bothered." Obama described the words as "like a fist in my stomach." It was a life-changing moment for him. Charles Payne says his sister's response to the reference was "like, 'Oh, well.'" But his reaction was that Obama shouldn't have shared that anecdote. "She was really a very liberal person; liberal in politics and, I think, liberal in thinking," says the brother, who has worked hard on his great-nephew's campaign. "Frankly ... that story, when it was in the book, I felt didn't need to be in there." After Madelyn Dunham retired from Bankoh in 1986, she didn't just sit back. Over the years she's worked for various charitable organizations. She did volunteer at the local library, as well as the Oahu Circuit Court, where she served as a court observer, probate aide and arbitrator for the Juvenile Monetary Restitution Program. Madelyn Dunham loved to play bridge. "When Stanley was still alive, they would go on cruises around the islands and they'd do nothing but play bridge," says brother Jack. "She and Stanley were vicious bridge players." When Stanley died in 1992, she continued to play, as many as six days a week. Until a few years ago, when failing eyesight and osteoporosis got the better of her, she would go to the brick recreation center at the Ala Wai Community Park near Waikiki to play duplicate bridge with the Honolulu Seniors. Obama left the campaign trail at a crucial time just two weeks before the election to spend time with his grandmother. "Her body is not in great shape she has osteoporosis which means she can't travel. She can't sit for a long periods of time on the plane so that's why it is so important for me to take these trips back to Hawaii," Obama said. "She has been frail for quite sometime now." "She was a very determined person as you began to get to know her she knew her mind and followed her principles," said University of Hawaii professor Alice Dewey, a longtime friend of the Obamas. ""She probably stayed on his case make him tow the line and behave himself with the best of intentions and great affection for him." Obama's decision to be at her side in her time of need does not surprise those who know him. "The whole family is quite special," Dewey said. Friends said Obama's urgency to get back to Hawaii to visit his grandmother could be fueled by one of his greatest regrets which is not being in Hawaii for the death of his mother, Ann Dunham, who died at age 52 of ovarian cancer. Obama said he did not want to make the same mistake twice. "One of the things I wanted to have a chance to sit down with her and talk to her. She's still alert and she still has all the faculties and I wanted to make sure that I don't miss that opportunity right now," Obama told ABC's "Good Morning America" before he left for the islands. In 2008 Madelyn Dunham died at age 86 after a battle with cancer. 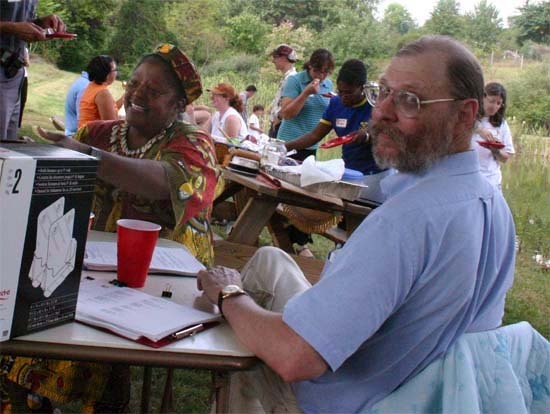 Madelyn died on November 2, 2008, the day before Barack Obama's election as President. "She died peacefully in her sleep with my sister at her side, so there’s great joy instead of tears," said Barack Obama. "She was one of those quiet heroes that we have all across America. They’re not famous. Their names are not in the newspapers, but each and every day they work hard." 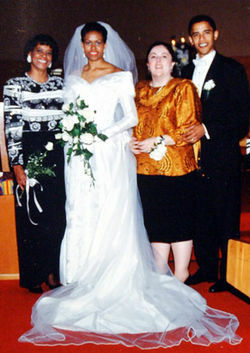 In 1992 Stanley Ann Dunham's son Barack Obama web Michelle Robinson on October 18, 1992, with Michelle’s mother, Marian Robinson, at left, and Barack’s mother, Stanley Ann Dunham attended the ceremony. Barack Obama's grandfather Stanley Dunham did not live to see his grandson Barack Obama marry Michelle Robinson having died nine months earlier in February 1992. Bararck Obama's mother Stanley Ann Dunham was to die of ovarian cancer in 1996 four years after her son marriage to Michelle Robinson. Photo: From Polaris. Beatrice Gormley writes in "Barack Obama" that Stanley Ann was born in Fort Leavenworth, Kansas in 1942 while Stanley was in the army waiting to be shipped off to France to fight under General Patton. Obama's mother Stanley Ann Dunham had the unusual male first name of Stanley. Stanley Ann had been named after her father because he had wanted a boy. David Remnick reports in his book "The Bridge" that Stanley Ann took to introducing herself by saying: "Hi, I'm Stanley. My dad wanted a boy." Time Magazine says that Obama's mother "endured the expected teasing over this indignity, but dutifully lugged the name through high school, apologizing for it each time she introduced herself in a new town." However, the article continued, "By college, she had started introducing herself as Ann". When Barack Obama's mother Stanley Ann Dunham arrived in Ponca City she was six years old in 1948 and went to first, second and third grade in the Ponca City School System. Beverly Bryant reported in the Ponca City News that Stanley Ann Dunham attended first and second grade at old Jefferson Elementary School. School records from the Ponca City Public Schools show that the Dunham family moved to Ponca City from Wichita, Kansas and lived at 515 West Central when they first moved to Ponca City. This put the family in the school district for Jefferson School and Stanley Ann Dunham began attending Jefferson on September 7, 1948 when she was 5 years 9 months old. Stnaley Ann continued attending Jefferson in the second grade. Miriam Walker Carson attended Jefferson School and was in Stanley Ann's first grade class. Although Carson does not remember Stanley Ann, she did remember that the first grade teacher was Joyce Bradfield and that there were about twenty-five students in the first grade class. (Loraine) Joyce Bradfield was Stanley Ann's first grade teacher at Jefferson School in Ponca City. Bradfield, born in 1903 and never married, was a lifelong school teacher who taught first grade for 43 years, most of that time at Jefferson School. Bradfield and was about 45 years old when she taught Stanley Ann Dunham and had already been a first grade teacher in Ponca City for about 20 years. Bradfield had graduated from the University of Oklahoma in 1929 with a bachelor of science degree and had earned her master's degree from the University of Colorado at Boulder in 1941. Bradfield died in 1997 at age 94. "Isn't it tragic that Joyce Bradfield spent 43 years in the Ponca City school system teaching hundreds of children," says long time Ponca City resident Deloris Pickens, "but that she didn't live to know that one of her students would grow up to become the mother of the President of the United States." In 1950 Stanley Dunham purchased a house on North 13th Street right across the street from the First Episcopal Church. Because of the move, Stanley Ann entered a new school district and transferred to Roosevelt Elementary School to attend third grade. 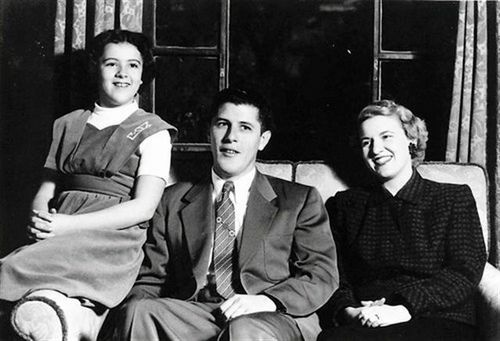 The Dunham family left Ponca City on March 9, 1951 after Stanley Ann Dunham completed 116 days of class in third grade and the family moved to Vernon, Texas. Stanley Ann's life after she left Ponca City and went to live with her parents in Seattle where her father worked in the post-war boom selling furniture was far different than her childhood in the mid-west. "She was not a standard-issue girl. You don't start out life as a girl with a name like Stanley without some sense you are not ordinary," said former Seattle classmate Chip Wall who knew Stanley Ann in the early 1960's. "Her life showed a deep respect for intellectual rigor and perhaps an uncommon sense of learning," said Obama's half-sister, Maya Soetoro-Ng, who lives in Hawaii. 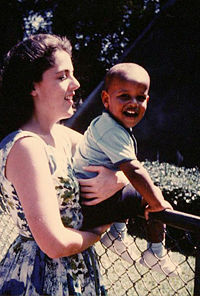 Ann Dunham with her two-year-old son, Barack, in 1963. “She was sort of unflinchingly and unwaveringly empathetic,” says Barack’s half-sister, Maya Soetoro-Ng. “She was always very good at finding a language that the other person would understand, regardless of where they were from, or their socio-economic background. And I think that’s … a major gift that’s bestowed on us.” Photo: Polaris. Stanley Ann met a Kenyan student named Barack Obama at the University of Hawaii and married him in 1960 giving birth to Barack Obama Jr. in August 1961. "We could see Stanley, with her good grades and intelligence, going to college, but not marrying and having a baby right away," said Maxine Box, her best friend at the time and now a retired teacher in Bellevue, Washington. "I can't think of anything she said or did that would lead to such a radical thing. At that time, you practically crossed the street if you saw a black man and a white woman. Black and white didn't go together at that time." "The marriage was brief," wrote Jonathon Martin in the Seattle Times. "By 1962, Dunham had returned to Seattle as a single mother, enrolling in the UW for spring quarter and living in an apartment on Capitol Hill [in Washington State]. But friends said she got overwhelmed and returned to her family in Hawaii, and formally divorced Obama Sr. in 1964." Stanley Ann Dunham met an Indonesian student, Lolo Soetoro, at the East-West Center on the University of Hawaii campus. They married in 1966 or 1967 and moved with six-year-old Barack to Jakarta, Indonesia, after the unrest surrounding the ascent of Suharto, where Soetoro worked as a government relations consultant with Mobil Corporation, the US-based international petroleum company. Soetoro and Stanley Ann Dunham had a daughter, Maya Kassandra Soetoro, on August 15, 1970. In Indonesia, Stanley An Dunham enriched her son's education with correspondence courses in English, recordings of Mahalia Jackson, and speeches by the Rev. Dr. Martin Luther King Jr. She sent the young Obama back to Hawaii rather than having him stay in Asia with her, though the decision was painful for her. Madelyn Dunham's job as a vice-president at the Bank of Hawaii helped pay the steep tuition at Punahou School, with some assistance from a scholarship. In the 1970s, Stanley Ann Dunham wished to return to work, but Soetoro wanted more children. She once said that he became more American as she became more Javanese. 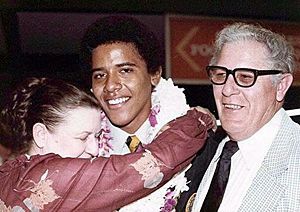 Stanley Ann Dunham left Soetoro in 1972, returning to Hawaii and reuniting with her son Barack for several years. Soetoro and Stanley Ann Dunham saw each other periodically in the 1970s when Stanley Ann Dunham returned to Indonesia for her fieldwork but did not live together again. They divorced in 1980, at which time she began using the name Ann Dunham Sutoro, with a modern spelling of her former husband's surname. Dunhammichell marriage Stanley Ann Dunham was not estranged from either ex-husband, and encouraged her children to feel connected to their fathers. She returned to graduate school in Honolulu in 1974, while raising Barack and Maya. When Stanley Ann Dunham returned to Indonesia for field work in 1977 with Maya, her teenage son Barack Obama chose not to go, preferring to finish high school in the United States, living with Stanley Ann's mother Madelyn Dunham and her father Stanley Dunham who raised Barack Obama in her absence. Caption: In 1992 Stanley Ann Dunham's son Barack Obama web Michelle Robinson on October 18, 1992, with Michelle’s mother, Marian Robinson, at left, and Barack’s mother, Stanley Ann Dunham attended the ceremony. Barack Obama's grandfather Stanley Dunham did not live to see his grandson Barack Obama marry Michelle Robinson having died nine month earlier in February 1992. Photo: From Polaris. Having been a weaver, Stanley Ann Dunham was interested in village industries, therefore moved to Yogyakarta, the center of Javanese handicrafts. In 1992 she earned a Ph.D. in anthropology from the University of Hawaii, under the supervision of Prof. Alice Dewey, with a dissertation titled Peasant blacksmithing in Indonesia: surviving and thriving against all odds. Stanley Ann Dunham pursued a career in rural development championing women’s work and microcredit for the world’s poor, with Indonesia’s oldest bank, the United States Agency for International Development, the Ford Foundation, Women's World Banking, and as a consultant in Pakistan. In 1995 Stanley Ann died tragically of ovarian cancer at age 52 after a career as an anthropologist working in Indonesia, Pakistan, and all around the world. "The life that Stanley chose to live after she left is indicative of the fact that Stanley thought about what else was out there," said Iona Stenhouse, a classmate in Washington State. "She was ready for having different experiences." Alternately, if you know my mother Deloris Pickens give her a call at 580-765-6125 with any information you have on the Dunham family. She and my father Dale Pickens were both living here in Ponca City when the events in this article took place. Here is my link to the permanent article I am writing about Barack Obama's mother's life in Ponca City in the early 1950's. I'll keep this story updated with the latest information I find out about Barack Obama's mother Stanley Ann Dunham and her two years living in Ponca City in the early 1950's. Thanks to everyone who has helped research this story with special thanks to Deloris Pickens, Beverly Bryant, Pat Moore, Bob Casey, and Dale Smith. 1. 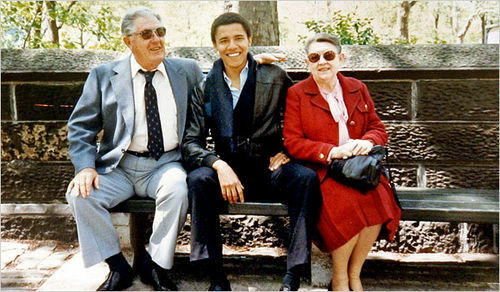 Photo of Barack Obama with his grandparents Madelyn Dunham and Stanley Dunham in the early 1980's while Obama was attending Columbia Law School. Photo: Obama for America. 1. Washington Post. "Though Obama Had to Leave to Find Himself, It Is Hawaii That Made His Rise Possible" by David Marannis August 22, 2008. 4. Wikipedia. "Ann Dunham" Note. Wikipedia was used to provide a basic framework for the life of Stanley Ann Dunham. The entire section on Dunham's life after her divorce from Brack Obama's father is excerpted verbatim from the Wikipedia article on "Ann Dunham" under a Creative Commons Attribution-Commercial license. 5. Wikipedia. "Madelyn Lee Payne Dunham"
6. Wikipedia. "Stanley Armour Dunham"
11. The Seattle Times. "Obama's mother known here as "uncommon" by Jonathan Martin. April 8, 2008. 12. Interview with Bob Casey by Hugh Pickens. February 6, 2009. 14. New York Times. "Obama Makes Visit to a Most Beloved Supporter" by Jeff Seleny. October 24, 2008. 15. New York Times "Obama Briefly Leaving Trail to See Ill Grandmother" by Michael Powell. October 20, 2008. 16. New York Times. "Barack Obama: To His Grandmother’s Bedside" by the Editorial Board. October 24, 2008. 17. Interview with Pat Moore by Hugh Pickens. February 6, 2009. 18. The Ponca City News. Article by Beverly Bryant. February 8, 2009. 19. Vanity Fair. "Raising Obama" by Todd Purdum. March 2008. The captions used for the three Polaris photos used in this article are taken from the Vanity Fair article. ↑ "Into the Story: A Writer's Journey Through Life, Politics, Sports and Loss" by David Maraniss. Simon and Schuster. 2010. Page 70. ↑ 2.0 2.1 2.2 2.3 2.4 2.5 KITV News. "Cancer Returns For Obama's Grandmother" October 21, 2008. ↑ 3.0 3.1 Washington Post. "Though Obama Had to Leave to Find Himself, It Is Hawaii That Made His Rise Possible" by David Marannis August 22, 2008. ↑ 4.0 4.1 4.2 4.3 4.4 The Ponca City News. "Obama's Family Once Lived in PC" by Beverly Bryant. February 9, 2009. ↑ Chicago Sun Times. "Mareen Duvall: No More Striking Figure" by Scott Fornek. Setember 9, 2007. ↑ See The Dunham House. ↑ 8.00 8.01 8.02 8.03 8.04 8.05 8.06 8.07 8.08 8.09 8.10 8.11 8.12 8.13 Wikipedia. "Biography of Stanley Dunham" May 7, 2009. ↑ Newsweek Magazine. "What Barack Obama Learned from His Father" by Jon Meacham. August 23, 2008. ↑ 10.0 10.1 10.2 10.3 10.4 10.5 KAKE News. 'President Obama: From Kansas to the Capital" by Susan Peters. ↑ 11.00 11.01 11.02 11.03 11.04 11.05 11.06 11.07 11.08 11.09 11.10 11.11 11.12 Associated Press "Obama's grandfather Stanley Dunham" by Nancy Benac. May 30, 2009. ↑ 12.00 12.01 12.02 12.03 12.04 12.05 12.06 12.07 12.08 12.09 12.10 12.11 Interview with Bob Casey by Hugh Pickens. February 6, 2009. ↑ 13.0 13.1 13.2 Interview with Pat Moore by Hugh Pickens. February 6, 2009. ↑ 14.0 14.1 14.2 14.3 14.4 14.5 Interview with Bill Piel by Hugh Pickens. February 23, 2009. ↑ History Link. "Stanley Ann Dunham, mother of Barack Obama, graduates from Mercer Island High School in June 1960" by Phil Dougherty. February 7, 2009. ↑ 16.0 16.1 16.2 16.3 16.4 16.5 16.6 16.7 16.8 Remorial. "Dunham, Madelyn Lee Payne - 85 - Hawaii"
↑ 18.00 18.01 18.02 18.03 18.04 18.05 18.06 18.07 18.08 18.09 18.10 18.11 USA Today. "Family precedent: Obama's grandmother blazed trails" by Dan Nakaso, USA TODAY. April 7, 2008. ↑ Baltimore Sun. "Barack Obama: Mother not just a girl from Kansas" by Tim Jones. March 27, 2007. ↑ 20.00 20.01 20.02 20.03 20.04 20.05 20.06 20.07 20.08 20.09 20.10 20.11 20.12 20.13 20.14 20.15 20.16 20.17 20.18 20.19 20.20 20.21 20.22 20.23 20.24 20.25 20.26 20.27 20.28 20.29 20.30 20.31 20.32 20.33 20.34 20.35 20.36 Cleveland Plain Dealer. "'Toot': Obama grandma a force that shaped him" by Bill Meyer. August 24, 2008. ↑ 21.0 21.1 21.2 21.3 21.4 Honolulu Advertiser. "Barack Obama's grandma, 86, dies of cancer before election" by Dan Nacaso. November 4, 2008. ↑ 22.0 22.1 "The Bridge: The Life and Rise of Barack Obama" by David Remnick. Random House. 2010. Page 45. ↑ Online Highways Home. "Via Christi Oklahoma Regional Medical Center"
↑ 24.0 24.1 24.2 24.3 24.4 KITV News. "Hundreds Gather To Remember Madelyn Dunham" November 15, 2008. ↑ 25.0 25.1 25.2 25.3 25.4 25.5 25.6 KITV News. "Senator Leaves Campaign Trail To Make Visit" October 20, 2008. ↑ 26.0 26.1 26.2 26.3 KITV News. "Obama Says Goodbye To 'Toot'" October 24, 2008. ↑ 28.0 28.1 Interview with Miriam Walker Carson by Hugh Pickens. February 9, 2009. ↑ "Obituary for Loraine Joyce Bradfield" The Ponca City News. August 5, 1997. This page has been accessed 252,628 times.